OXFORD, Miss. – Two Ole Miss chapters of pharmacy honors societies will co-host a banquet this Friday to initiate new members into both societies and recognize the outstanding academics and leadership of existing society members. The UM chapter of the Rho Chi Society, which honors pharmacy academic achievement, will induct 22 second-year pharmacy students, 15 graduate students and two faculty members. Pharmacy students must be academically in the top 20% of their class to be considered for Rho Chi. 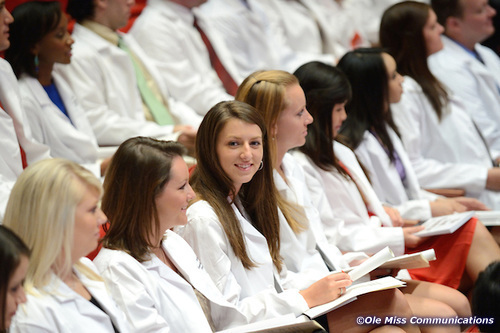 Phi Lambda Sigma honors those who demonstrate leadership in pharmacy, and the Ole Miss chapter will induct 27 students and two faculty members. Student inductees into Phi Lambda Sigma must be nominated by their peers who are currently in the organization. Five students will be inducted into both Phi Lambda Sigma and Rho Chi. The banquet and initiation ceremony will be held at the Jackson Avenue Center on Friday, April 28.